Laparoscopic surgeons receive distorted force feedback during tissue manipulation. Research shows that sensory augmentation using vibrotactile stimulation with amplitude modulation enhances performance in tissue differentiation tasks. It was hypothesized that the capacity of information transmission through vibration can be increased by adding signal frequency and spatial location modulations. A study was conducted to evaluate this hypothesis. Ten naïve subjects performed 104 trials of a tissue compliance differentiation task using a laparoscopic tool while wearing the vibration device on the non-active arm. The task required subjects to probe two simulated tissue with a laparoscopic tool to assess whether the second sample was harder than, softer than, or the same in compliance as the first sample. Subjects received vibrotactile stimulation in 4 conditions: 1) Frequency, in which vibration frequency varied as a function of applied force, 2) Location, in which the spatial location of the active vibration motors varied as a function of applied force, 3) Combination, in which both vibration frequency and location changed in response to applied force, and 4) No Vibration, in which no vibration feedback was provided. Data analysis using analysis of variance (ANOVA) showed a significant main effect in vibration conditions for maximum applied force (p = 0.002); however, a post-hoc Tukey test revealed no further significance. There were no significant differences in either accuracy or time to task completion. Subjective results indicated that subjects differed in their assessment of which vibration feedback condition was most useful. Data were separated into three groups according to feedback preference, and t-tests revealed that subjects who preferred the Frequency modulation and Combination modulation were significantly more accurate in these conditions than in the No Vibration condition (p = 0.006, p = 0.005, respectively). These results suggest that subjects were not equally sensitive to vibration frequency modulation, as they were to amplitude modulation. 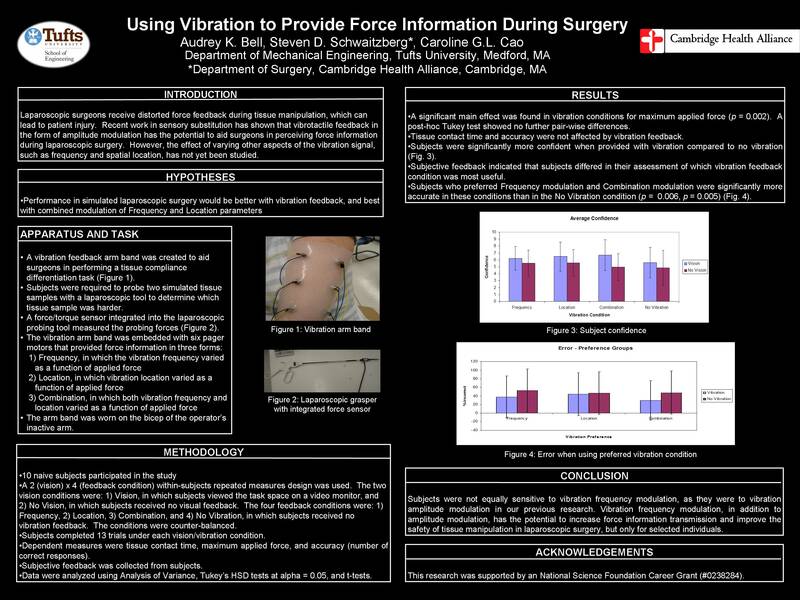 Vibration frequency modulation, in addition to amplitude modulation, has the potential to increase the capacity of force information transmission and improve the safety of tissue manipulation in laparoscopic surgery, but only for selected individuals.